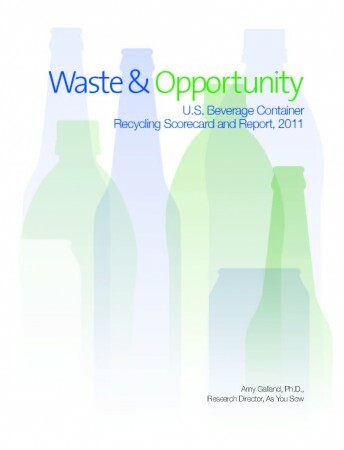 Waste & Opportunity 2011 is based primarily on responses to As You Sow’s Beverage Container Recycling Survey. The Survey was sent to 45 companies, double the number of the 2008 report, and includes beverage companies, grocery manufacturers with private label beverage brands, fast food restaurant chains, and packaged food companies. Survey respondents said that in developing a recycling program, they are most likely to support programs that set recycling fees paid by producers or importers that are included in the price of the product and administered by industry. Two key brands, The Coca-Cola Company and Nestlé Waters North America, have started to press publicly for state extended producer responsibility (EPR) laws for post-consumer packaging similar to those in place in Canada and Europe. The beverage industry needs to greatly increase engagement and integration with stakeholders and other industries such as consumer packaged goods and grocery retailers who produce private labels in order to have strong buy-in for producer responsibility packaging legislation and to reach agreement on related policies to increase beverage container recycling rates. Anheuser Busch and MillerCoors need to participate in future surveys and set aggressive recycling goals, increase disclosure, and work with other brands on ways to jointly boost container recovery. Read the press release and recent news articles; see below for a full list of companies contacted with the survey.